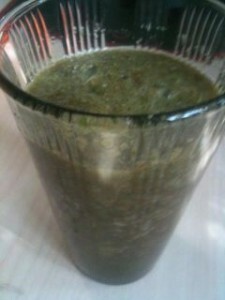 Add half of the water to blender first then add more after everything is blended to get your desired consistency. I used honey crisp apples today. Honey crisps are delicious and complement all vegetables. The color of this smoothie might be a litte darker green and not as visually aesthetic than most of my other recipes because of the Swiss Chard but it tastes great. Cheers!